The Spectral Assassin is the spirit of an infamous and well-known Imperial assassin of the Dark Brotherhood, Lucien Lachance. He now serves Sithis as a spirit and, thanks to you, is able to continue his work. He can be summoned once a day with the power Summon Spectral Assassin, given as reward for completing Bound Until Death. The Spectral Assassin is essentially a free follower. He will follow you anywhere at all times until he is killed (although he can get lost). He is equipped with the Dark Brotherhood shrouded robes with matching hand wraps, hood, and shoes, and attacks using a steel dagger. He counts as a summon similar to those created with Conjuration spells, and will occupy the slot as the one summon you are allowed without the Twin Souls perk (see Bugs section). While he cannot be engaged in conversation, he will comment on many things while he is summoned, such as your current contract for the Dark Brotherhood, events from Oblivion, Sithis, and his own thoughts. It's also revealed that he traveled in Skyrim in his lifetime, prior to events in Oblivion, as he also remarks on each town you visit and his memories of the place. Lucien is able to communicate with Sithis, and ascertain the dread father's desires. In life, Lucien Lachance was an Imperial assassin and a Speaker of the Black Hand, the core governing body of the Dark Brotherhood. His only formal residence was Fort Farragut, east of Cheydinhal. He was a highly respected member of the Dark Brotherhood and even the Night Mother acknowledged his loyalty, berating a Speaker for claiming otherwise. Lucien Lachance was believed to be a traitor, but he was actually framed. He met a very gruesome death because of his suspected attempt to destroy the Dark Brotherhood. While summoned and following you, the Spectral Assassin can speak many lines based on the context of location, current quest, or other situations. Outside: "I remember Skyrim from my youth, and the glistening crimson on fields of white." Whiterun: "Whiterun, home of the Skyforge. It is said a blade forged in its fires can cut through sinew as if it were parchment." Riften: "I do so love Riften. I journeyed here in my youth. A thief took my purse... so I took his eyes. It was a fair exchange." Windhelm: "Windhelm. White as bone, and cold as the Void." Markarth: "An ancient city, Markarth. Build [sic] by the Dwemer, the dwarves of old. To think, an entire race... eradicated. Not even I can take credit for that feat." Solitude: "Ah, yes. Solitude. Seat of the High King of Skyrim. Messy business, kingslaying. Ah, but so very satisfying..."
College of Winterhold: "Do you feel it? Magic. Deep and ancient. It resonates from the College, like the beating of a heart." "You know, a good Purification might be just what this Sanctuary needs..."
"Dreary, dank, and dimly lit. Truly a Sanctuary to call home." Near Shadowmere: "Shadowmere, my old and dear friend..."
"In my time, the Blades protected the Emperor. It would seem these Penitus Oculatus will prove equally incompetent." "Stalking your prey, planting false evidence, destroying an innocent man's reputation. Truly a contract worthy of the Listener." "I will kill this jester if you so desire, but there is a disturbance in the Void. Our Dread Father does not wish this." "The Keeper is a sacred position within the Dark Brotherhood. Ask yourself - do you trust the wisdom of our Lady?" "Killing the Gourmet will leave an emptiness in the collective soul of Skyrim. This pleases me." "Yes. Kill the chef, and then steal his very identity. For that is the true death." "My time saw the assassination of an Emperor as well. Alas, the Dark Brotherhood did not have the honor of that kill." "A poison stew eh? I was always partial to apples, myself." "We must return to the Sanctuary! Your Family is in dire peril!" "We are the messengers of death, you and I. Together, we will unleash the unholy wrath of our Dread Father, Sithis." "The Sanctuary must be purged of its invading filth!" "The time has come to fulfill your destiny, Listener. Kill the Emperor, and restore the Dark Brotherhood to greatness." "You stand now at the precipice of the Void. I am reminded of another Listener, a protege [sic] I knew long ago. So long ago..."
"You wish to kill me? Someone has already had that honor. Hah!" "There is no pain in the Void!" "Ha ha! I've suffered worse!" "I weep for you, mortal." "Another soul for you, Father!" "Another thrall for the Void!" "You would shut out the darkness?" "I return to you, Father." "Perhaps we should find a random stranger to murder. Practice does make perfect." "Your enemies will soon know the wrath of Sithis." "Lead, and I will follow, child of darkness." "One day, you will serve our Dread Father as I do now." "In life, I was but a Speaker for the Black Hand. But you have been named Listener. There is no higher honor." "The Dread Father works through me. And his work has just begun." "All hail the savior of the Dark Brotherhood! All Hail [sic] the Listener!" "We are bonded now, you and I. Joined, through the powers of the Void." "Have you heard the tale of Mathieu Bellamont, and the great treachery of Cheydinhal? Kill a boy's mother, and vengeance festers in the son..."
"There is murder in the air. I can taste it." 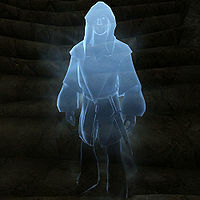 The Spectral Assassin is voiced by Wes Johnson, who voiced Lucien Lachance in Oblivion. He is considered a member of the Dark Brotherhood, so if you attack him, you will have to pay a fine to Nazir. Though he is considered a summoned creature, Restoration spells such as Healing Hands will heal him, letting you keep him as a summoned creature indefinitely (unless you summon another creature). Summoning the Spectral Assassin counts against your summon limit for Conjuration spells, and will make existing summons disappear as usual for such effects. However, the effect that summons him doesn't properly respect the Twin Souls perk—if you have the perk, summoning him will always make all your other summons vanish. If you have one, it will vanish as if you didn't have the perk; if you have two, both will vanish. Once he has been summoned, the Twin Souls perk allows you to summon a second creature alongside him as usual; only his moment of summoning ignores the perk. This may be to prevent the player from summoning two Spectral Assassins, which would make little sense. A bug can occur where he will no longer have the spectral texture but will in fact look like an ordinary NPC, wearing shrouded robes, similar to members of the Dark Brotherhood Sanctuary. It is unknown what causes this but he does eventually return to the 'spectral' state. 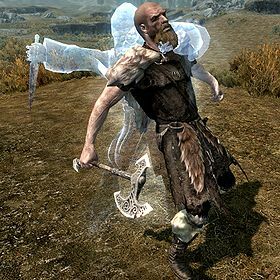 It is not possible to have the Spectral Assassin and the Hero of Sovngarde summon out together, even with the Twin Souls perk. Summoning one after the other will release the former. The same applies with the Arniel's Shade summon. This page was last modified on 18 October 2018, at 08:49.